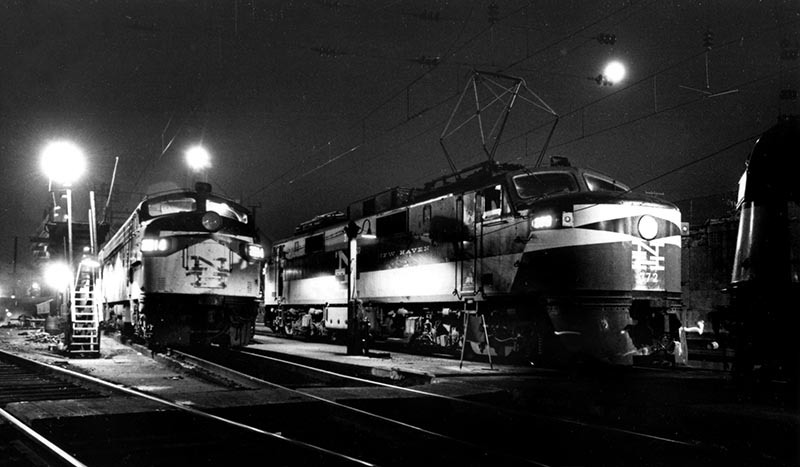 Visiting the engine terminal at New Haven, Conn., well after midnight, Jim Boyd captured EMD FL9s and GE EP-5s sharing the service tracks in June 1968. The FL9s were built between 1956 and 1960, while the EP-5 electrics were built in 1954. I was a budding 14-year-old railfan visiting the sprawling flea market with my parents at the old Stormville Airport in rural Stormville, N.Y. The fields were filled with endless rows of vendors manning tables and stalls overflowing with tchotchkes, ephemera, and bric-a-brac. A picker’s paradise, if you will. I had become quite skilled at quickly scanning the offerings to determine if it was worth stopping to dig through the merchandise or not. One vendor had a stack of old railroad magazines, and the issue on top caught my eye because of the article teased on the cover: “The Story of the FL9s,” complete with a photo of a red-white-and-black New Haven cab unit. 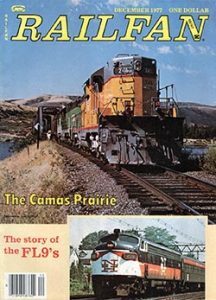 It was the December 1977 issue of Railfan, a magazine I wasn’t sure I had heard of before then. I quickly handed over my 50 cents and found a detailed feature story by author Casey Cavanaugh that explained the development and history of the unique dual-mode locomotives which were designed to either run off diesel or take power from the New York Central’s 600-volt third rail leading into Grand Central Terminal. After the New Haven was merged into Penn Central in 1969, the FL9s were quickly assigned to the former NYC Hudson and Harlem Divisions, helping to eliminate time-consuming engine changes at North White Plains and Harmon, N.Y., where the electrified territory ended. While renumbered from the 2000 to the 5000 series, many continued to operate in their original paint into the Conrail era. These former NH locomotives were still being operated by Metro-North when I made my purchase in 1991, and I was excited to learn more about the classic cab units I would see on my trips to New York with my dad. I read and re-read that article and eventually dog-eared that old magazine. Jim Boyd made a return trip to New York in 1970 and photographed FL9s and the United Aircraft TurboTrain in Grand Central Terminal. 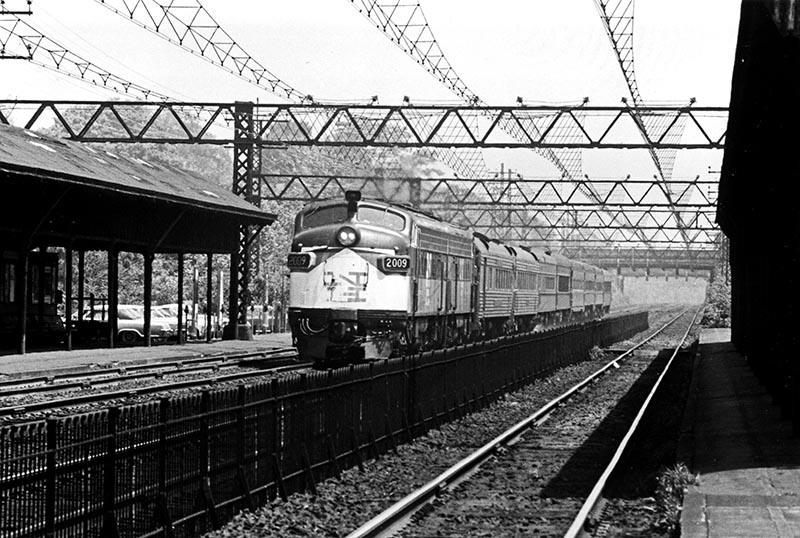 Both provided service on the New York–Boston corridor under Penn Central. Jim Boyd made one of his first trips from Illinois to the Northeast in June 1968 with the purpose of photographing the New Haven before it was swallowed up by the “mating worms” of Penn Central. Along for the ride were friends Bill Wagner and Mike Schafer. After making a whirlwind tour across Canada, New York, and northern New England, the trio dropped into Boston for their first taste of railroading on the New Haven. Schafer recalled they chased the departing Patriot and caught up with it again in New London, Conn. 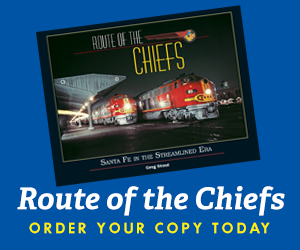 They made their way to New Haven where they boarded the 7:53 p.m. Merchants Limited for a spirited ride down the mainline to Grand Central Terminal. After spending an hour in the city, they boarded a late-evening express for the return trip to New Haven. The visitors hung out in the first vestibule behind the back-to-back FL9s to listen to the locomotives transition from electric to diesel propulsion just past the 125th Street station. Arriving back in New Haven after midnight, the group made some night photos in the engine terminal. Driving south, Schafer noted they could stop in Bridgeport to record the 3:00 a.m. departure of The Owl bound for Boston. After that brief stop, they arrived in Mamaroneck, N.Y., where they checked into a motel sometime after 4:00 a.m. Turning on the television, they learned of the tragic assassination of Sen. Robert Kennedy, adding a somber note to their journey. Jim’s 1966 Volkswagen Beetle needed service, and a garage that repaired foreign vehicles was found in Mamaroneck, N.Y. 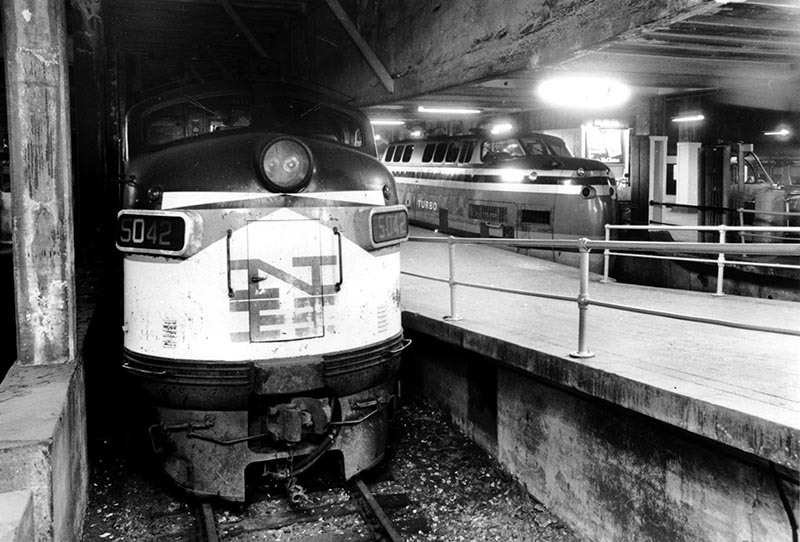 The day was spent shooting an endless parade of New Haven passenger trains on the four-track mainline in June 1968. Boyd dropped off his ’66 Volkswagen Beetle for service, and the day was spent photographing an endless parade of New Haven passenger (and freight) trains on the four-track mainline. 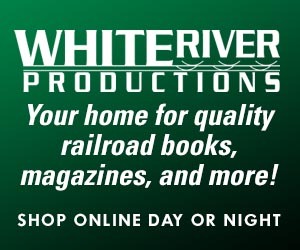 They also had lunch with Hal Carstens, who would eventually hire Boyd to join the editorial staff and later launch Railfan in 1974. Some of the photos from that 1968 trip ended up in the FL9 article published nine years later. 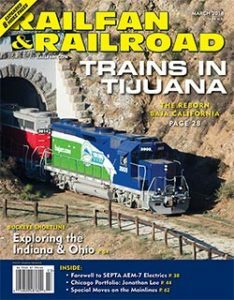 After a long career in publishing, Mike Schafer eventually became editor and our colleague at Passenger Train Journal (you can see some of his photos from this trip in the First Quarter 2018 issue of PTJ). The unique FL9s would eventually lose their New Haven identities, but would continue to soldier on in commuter service until the last were retired by Metro-North in January 2009. But that 1968 trip by Boyd and the later publication of his photos would indirectly start my own winding road to working for Railfan & Railroad.